The Punjab Pradesh Congress Committee has reportedly written to the party high command to take immediate disciplinary action against Mr Jagmeet Singh Brar, a former Member Parliament and member All-India Congress Committee, for his public outburst against Chief Minister, Capt Amarinder Singh. 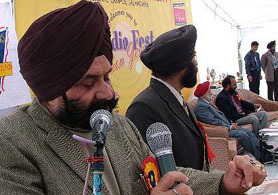 Congress leader Jagmeet Singh Brar today shot off a letter to Mrs Sonia Gandhi, President, Indian National Congress, levelling serious charges against Chief Minister Amarinder Singh and his colleagues. Mr Fakhar Zaman, president, World Punjabi Conference, yesterday sought the setting up of a joint commission of India and Pakistan for removal of distortions in history text books, which had generated a lot of bad blood among the neighbours. Punjabi intelligentsia from India and Pakistan had decided to take a major initiative to promote Punjabi language and culture for the promotion of peace between the two neighbouring countries. The Punjab Government is planning to enhance advertisement support to vernacular media of Punjab. Announcing this at a function organised by the Guru Nanak Dev University’s regional centre here today, Mr B.I.S. Chahal, Media Adviser to the Punjab Chief Minister, said with a view to strengthening vernacular, small and medium newspapers of Punjab, the state government was planning to extend more advertisement support to them. A local court today issued non-bailable warrants against Kuldeep Singh, who is the prime witness of the CBI in the ongoing case in which seven police personnel stand accused of murdering human right activist Paramjit Singh Khalra and disposing off the body by throwing it into a canal. 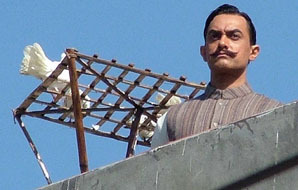 Crowds swelled near the golden temple to see Aamir Khan enact the role of Bhagat Singh for the film “Rang de Basanti” shot for the second day here today. Declaring Netaji Subhas Chandra Bose a victim of an international conspiracy, the All-India Forward Bloc and the Netaji Probe and Research Foundation, New Delhi, today asked the Government of India to extend the term of Justice Mukherjee Commission of Inquiry probing into the mysterious disappearance of Netaji Subhas Chandra Bose for another six months. Ranjeet Kaur was quite happy with her marriage and had no problem with her husband, Kuldeep Singh. But the quarrel between Kuldeep and his family members forced him to commit suicide. A team of three Chief Engineers and a project manager of the National Hydro Power Corporation on Thursday visited and supervised the site of the Shahpur Kandi project. The team comprised the Chief Engineers Mr SK Dubey, Mr Manoj Basu and Mr Rajiv Batwaria. Lt-Gen S. Pattabhiraman, GOC- in-C, Western Command, a long with his wife Laxmi Raman, today paid obeisance at the historic gurdwara at Khadoor Sahib, 22 km from here. He was presented with a siropa and literature related to second Sikh Guru Angad Dev by Baba Sewa Singh, head of the kar seva, Khadoor Sahib. A person was killed while two others were injured when the roof of a room in a dairy farm collapsed in the Gulmarg colony area here today. On the second day of the sixth All-India Disabled Conference being held at Bachat Bhavan, Mr Didar Singh Bhatti, member, SGPC, was the chief guest. Cautioning Indian visa seekers against consultancy services provided by a large number of self-styled immigration and visa consultants and agents, the authorities Canadian High Commission have clarified that it or the Canadian Immigration authorities only deal with those registered with the Association of Consultants of Canada. A red-alert was sounded in the district and the police set up nakas at several places today after a rumour spread that one person was shot dead by two identified persons near Bindrakhiya village in the morning. A local court yesterday extended the police remand of Abhi’s alleged kidnappers and murderers till February 28. Mr Justice Baldev Singh of the Punjab and Haryana High Court has granted bail to Mrs Sheela Devi and her daughter Meera Rani in Sheela Devi versus State of Punjab case. According to information, the orders were passed after Sheela Devi and Meera Rani had moved an application for the grant of bail. A team of the CIA staff, led by Mr Devinder Singh Malhi of Bahadur Singh Wala, arrested two kidnappers namely Sohan Sikandar of Sahnewal village and Pritpal Singh of Alamgir village from Dhuri area on Thursday night. The police has claimed to have unearthed a racket of flesh trade in a residential area here and arrested five persons, including two girls, in this regard. Harjit Singh, a resident of Patti, was arrested by the jail authorities allegedly for possessing intoxicants which were meant to be delivered to a prisoner. He was nabbed with the contraband which he had concealed in a ghee container. He has been handed over to the Gumtala police and a case has been registered. Fifteen boxes of liquor were seized by the police at a naka at Landarn chowk last night. In an effort to reach students in rural and remote areas, Guru Nanak Dev University has decided to transmit special lectures via “Edusat project” run by the Government of India. For writer Ramachandra Guha his visit to Yadavindra Public School here was special in more ways than one. He was coming to an institution which is now headed by his old Doon School teacher and also one where he scored the most swashbuckling innings in Cricket. The Vice-Chancellor of Punjab Agricultural University (PAU), Dr K S Aulakh, was today conferred the rank of Honorary Colonel in the National Cadet Corps (NCC) at a ceremony organised at the Punjab Raj Bhawan here today. A workshop on media ethics was organised at the Maharaja Ranjit Singh Regional Campus of Guru Nanak Dev University here on Friday. Mr D.K. Tiwari, District Magistrate, Hoshiarpur, in a press note here today said the Punjab School Education Board examinations of Classes X and XII would be held from March 2 to 16 and March 2 to April 4, respectively.